I’ve had a green smoothie for breakfast Monday through Friday for the past two weeks. I don’t have them on the weekends because we usually have big breakfasts on Saturday and Sunday and skip lunch. Last week I used the recipe I told you about in this post with the frozen mango. This week I changed it up a bit because I ran out of mango and had some frozen berries already in the freezer. 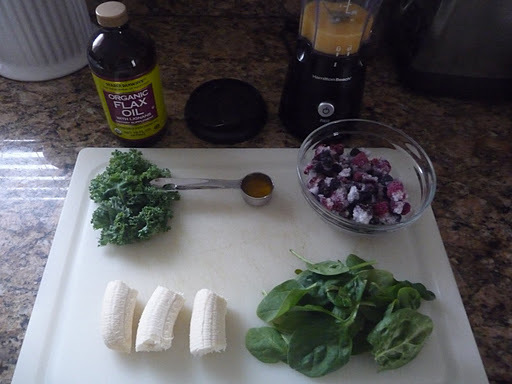 I use almost a whole banana, a handful each of spinach and kale, some frozen blueberries, raspberries, and blackberries – mine were icy, but that was ok with me, OJ – I switched to light OJ this time to cut down the calories, and a tablespoon of flax oil. My mom bought a book by Robyn Openshaw called The Green Smoothies Diet and it said to add flax oil, so I do now. If you’re doing the real smoothie diet according to the book, you’re supposed to have one for breakfast and another for dinner with a sensible lunch. I can’t handle that, though, so I’m sticking with my breakfast smoothies. I’ve also been having salads almost everyday for lunch, so I feel like I’m eating healthier than I was a month ago. I have a ton of apples that aren’t crunchy anymore, but they’re far from going bad, so I might try those for next week. I’ll let you know how it goes! What do you eat for breakfast, if anything? I do breakfast smoothies too. I use 1/2 cup soymilk, 1/2 cup water, 1 cup frozen berries, 1 scoop protein powder. I used to add frozen chopped spinach, but I stopped for some reason. pro tip: slice your bananas, lay them flat on a plate, and freeze them. put the frozen pieces to the blender.